In my last post, I introduced the three training methods that I use to modify behavior in dogs (correct, desensitize and condition) and elaborated on the concept of desensitizing. This time, I’ll dive deeper into “conditioning”, what it means and how to use it. Remember, one of the biggest mistakes that is often made by dog owners and trainers is that they use the wrong training style for the given situation. Understanding what these training styles are and when to use them will help us to build stronger relationships with our dogs and achieve greater training results. To “ condition” a dog to do something, is to instill a behavior that the dog will unconsciously do (or not do) without even knowing why it’s doing (or not doing) it. For instance, some dogs are conditioned to walk on one particular side of the human, say, the left side. By practicing a certain series of repetitive behaviors the trainer conditions the dog to, even if the human puts the dog on the right side, bounce right back over to the left. This is a simple illustration of a dog that has been conditioned to perform a specific behavior. We humans have conditioned ourselves to do a number of tasks, often without even knowing it. For instance, every time I walk through the kitchen, I check that the stove is turned off. I don’t need to tell myself to do it, it’s like I’m magnetically drawn to check the stove, and usually I don’t even know that I’ve done it. It’s like I’ve assigned that task to autopilot. I’ll admit that I check that the stove is turned off more often than I need to, but it’s a good example of a conditioned behavior that most people can relate to. Back to dogs. Conditioning a behavior in a dog is best reserved for unnatural behaviors that we’d like see from them. Most behaviors that we require from our dogs in order for them to fit in our lives come naturally, and there is a better style of drawing these behaviors out, but a few do not. Separation anxiety is a huge problem because dogs are not made to be alone. It’s a natural instinct for a dog to go into panic mode when left alone and try to get back to it’s pack. We can condition our dogs to think of the time that they are left alone as a peaceful and restful time by taking them for a long fulfilling walk or more strenuous exercise first, making them exhausted. If we do this every time our dogs are going to be left alone, over a long period of time, they will be conditioned to go into a very restful state when we leave the house even if they are not always exhausted. Another way that I like to use conditioning is what I like to call “make invisible”. We can condition our dogs to completely forget that things exist, almost like they’ve become invisible. I use this with my couch. I’m a neat freak and it drives me crazy when the couch is covered in dog hair. In the past, if left alone, my dog would, without fail, jump up on the couch to take a nap. This is not something she does if I’m at home, but when I’m away, she thinks that she can get away with it. By covering the couch in newspaper (so that it’s uncomfortable, you can use foil, whatever) every time that I left, over a long period of time she totally forgot that the couch was an option and I no longer need to use the newspaper. She doesn’t even look at it anymore! Here’s my favorite human version of “make invisible”: Have you ever spent a Saturday going through your closet and filled a box with items to bring to the thrift store? You put it by the front door thinking that next time you’re leaving the house you’ll toss it in the car and drop it off. Over the next couple of days you see the box and think “oh yeah, I need to bring that to Goodwill.” A week later, you don’t even see the box anymore, it has become part of the scenery in your house and you no longer even notice it. The box has become invisible just like the couch has become invisible to my dog. These are just a couple of ways that conditioning can give us leverage with our dog training goals. Conditioning is not an all encompassing training technique, but it is a very powerful tool to use from time to time to help our dogs to live their most fulfilling lives. Remember, conditioning is best used for behaviors that come unnaturally to dogs. Behaviors like walking beside a human properly, or interacting politely with other dogs, that dogs have been doing on their own for hundreds of years without our assistance are better left to other methods. Sign up with your email address to receive blog posts in email newsletter form. 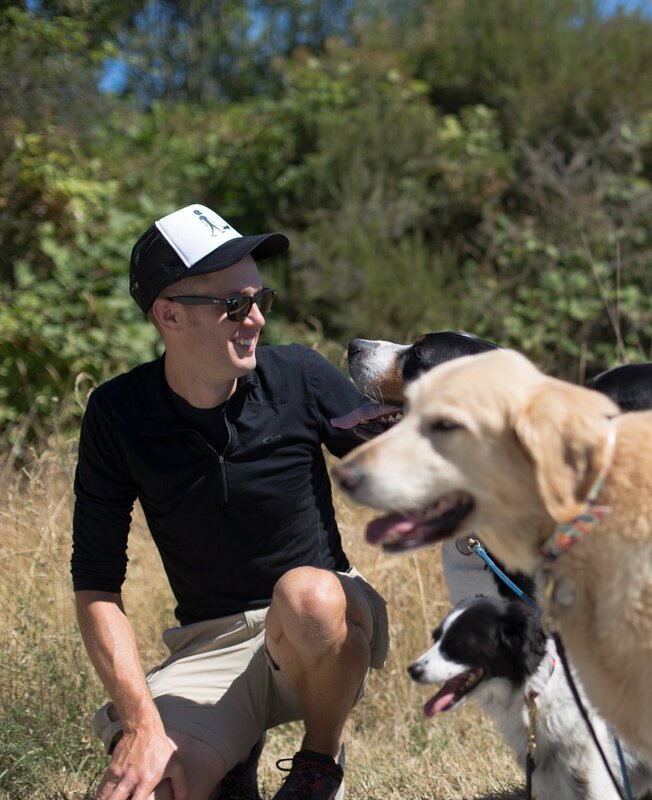 My name is Dustin Schmidt and I've been working with dogs since 2004. I'm a former professional dog musher and the owner of Less Talk, More Walk, a dog training and walking business in Seattle, WA. One of the mantras that I find myself repeating often is: "dog training is a journey." There are no quick fixes, it takes a lot of work, but the journey IS the destination. This blog is to document my dog training journey as well as to help you on yours.